The rain has continued now for the past two days and while it brings much needed moisture to the grounds it dampens any enthusiasm for one to go outside (pun intended). I’m ok with it at this time though as it supports my choice to get something accomplished indoors, chores around the house being one option. It also supports me spending some time blogging, which is getting sadly neglected and in dire need of a boost. I’ve managed to keep up my journal, the morning pages, and even though the weather is wet and cool I have stepped out of the house onto the deck to write. It is in the shelter of the house and is close enough to being outside at this time. I wrapped myself in a lap blanket and have persevered, relishing the freshness of the air and listening to the birds sing their spring songs. Our wind chimes play their tunes occasionally as well, and when the breeze picks up their rich notes bring a church-like quality to the atmosphere. What I’ve been waiting for however is the opportunity to sit in the area of our front yard where I feel at most at peace, the spot I’ve recently christened my “Holy place”. The descriptor came to me days ago when I was sitting in my recliner looking longingly out the window at that area, thinking the time will soon come when I can be out there, when both the weather and temperature will support my visit. 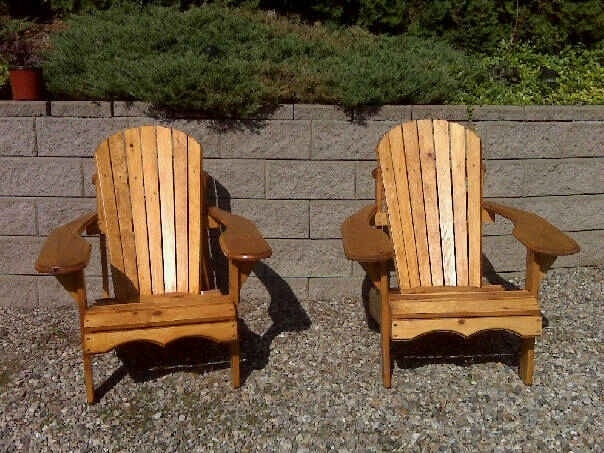 First, or best I should say, would be when my Adirondack chairs will be finished and placed in their special place under the boughs of the maple, where I can sit in the dappled shade and relish in the beauty of the moment. The fountain will be gurgling in the background and sweet fragrance of flowers will be in the air. The temperature will be perfect and my mind will temper it’s exuberance to take me into outside chores, there will be time a plenty for those. In addition to the peacefulness of the area it’s a spot that provides me a glimpse of my toys, a truck or two, and the camping trailer that’s about to be used. It’s a comfortable area and I feel enclosed in it’s graces. It saves me, I am at peace in my Holy place. Do you have a holy place, and if so where is it?